This entry was posted on September 29, 2013 at 4:40 pm and is filed under Action, Biography, Drama, Sports with tags 2013. You can follow any responses to this entry through the RSS 2.0 feed. You can leave a response, or trackback from your own site. Great review, Mark. I had no desire to see this one when I fist saw the trailer a few months ago but I’m now I’m really warming up to it. I think I may have a similar reaction to Rush to the one I had with Warrior or Wreck-it Ralph. Have no interest in MMA or videogames, but I loved both movies. The trailer didn’t really grab me either. I was in the dark as to who these people were so wasn’t sure why I should care about their story. Having seen the film, it entertains because it’s a compelling picture – action, drama, emotion – the script conveys all of this. Nice to know. I’ll be watching Rush this week. Good review Mark. Got to say, while I’ve never been a huge fan of Howard in the past, he definitely surprised the hell out of me here by how easily he coaxed me into actually caring about both of these drivers, as well as the races themselves. I didn’t really expect to care about 2 people I’ve never heard of, who participate in a sport I don’t watch either. Splash, Cocoon, Parenthood, Apollo 13, A Beautiful Mind: Ron Howard has directed some of the most beloved pictures of all time. He’s definitely a favorite. I guess I shouldn’t have been surprised to love Rush, but I did. A wonderful film. Oh man dude you got it. You got everything, EVERYthing that I loved about this picture. In fact, I upgraded my score on it because this review is so convincing. I think it could very well be the definitive racing movie. It’s as of right now my favorite Ron Howard picture. I mean, holy crap. The fact that it evenly appropriates both characters into their good qualities and bad is genius, not to mention how thoroughly accurate the racing events were and the off-the-track moments as well. First off, can I say how cool it is that my review caused you to adjust your own? I really loved this film so it’s nice to see my passion for it was felt. I really do think this is the definitive racing movie. I mean what else could it be? Le Mans (1971), Grand Prix (1966), Days of Thunder (1990), The Fast and the Furious (2001) are examples but none surpasses this film. I agree with you. One of my favorites for 2013.
haha yeah, it deserved the bump! btw, I’m not sure the last one i’ve read of yours that got the 4.5 out of 5. good stuff. It was Fruitvale Station :-). So glad you liked this Mark, I absolutely loved it. Probably one of my favourites of the year so far. Although Ron Howard has a reputation for being a bit safe and playing to the mainstream, I thought he was masterful in capturing the thrill of F1, right down to the noise of the cars. I’m glad you mentioned the noise. I saw this in XD which is Century Theatres’ Extreme Digital Cinema. The technology employs a larger screen with improvements in audio and digital projection. It’s kind of a feeble excuse to charge more for the same movie. However, the sounds were so loud they made the theater shake when the engines revved up. Pretty cool effect actually. Nice review. I was initially going to skip Rush since it seemed generic to me and Ron Howard’s a bit of a hit or miss director, but I’ll go see it now. I’ve enjoyed several of the director’s movies since 2001, but this ranks as my favorite Ron Howard film since A Beautiful Mind. Absolutely loved this film. Really worth a watch for anyone who is still umm-ing and ah-ing. I wish more would see it. It would surprise people. wow. i thought this movie was borderline awful. the racing scenes were fine, but there was no character depth whatsoever. i didn’t care what happened to these two characters. that’s a major problem for a film. It was the thrill of the competition to be the best that drove these men. Hard work and dedication, with some fun on the side in the case of James Hunt. I found their game of one-upmanship to be pretty compelling. Ron Howard has directed some truly great films. Although I have liked some of his recent efforts, it’s been awhile since I enjoyed one as much as this. 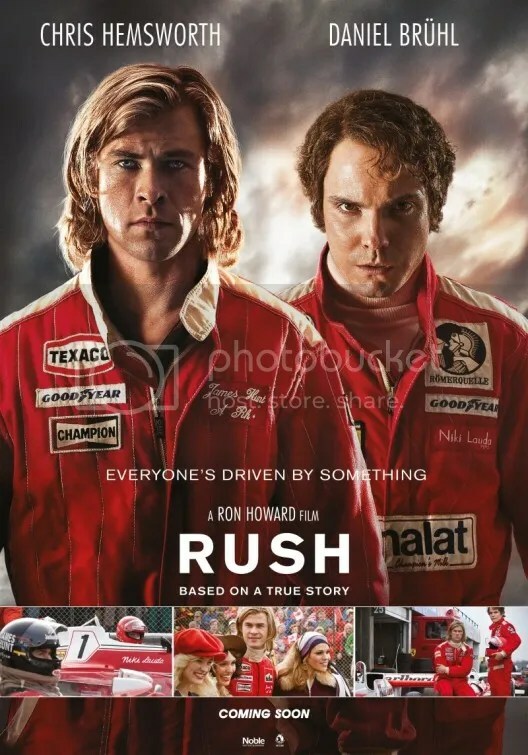 I also don’t generally care about racing, but I thoroughly enjoyed Rush because it made the subject approachable to me. It’s extremely well-paced and the racing scenes are thrilling. Do I consider it the best racing film of all time? I’m not so sure, although I can’t think of any better ones off the top of my head. It does remind me a lot of Days of Thunder and both movies even share the song “Gimme Some Lovin.” The major difference between the two is that instead of just fighting to be #1, the main characters in Rush are experiencing an ideological struggle as well. I named a list of possible best car racing films when responding to Tom above. I’m sure there are others but I don’t think there are any choices better than Rush. I really liked this film. Like you, I approached Rush with a decidedly lack of interest in car races. This year I looked at the Indy 500 and then the Grand Prix of Monaco. Once Rush was announced, I took another look at Grand Prix, LeMans, and one or two others. And like you I came away thinking that Rush was better than any of them. Simply – it was a superb piece of entertainment. Thanks for your well measured review. In my own review, I concluded that Hunt seemed the more flamboyant and outward character. And Lauda, the perfectionist, never really cared if people liked him. But I found it so difficult to root against Lauda. I liked how the narrative presented each man with their strengths and weaknesses. I think we were supposed to root for both at various times. Niki Lauda had so much heart. While I am more tepid on the film as a whole than you (and most others), I completely agree that Bruhl and Hemsworth are both terrific. Also agree that Howard manages a neutral tone, which serves the movie very well. It’s critically acclaimed but I don’t hear any Oscar buzz for it. Also, it was lackluster at the box office. I feel like I’m championing a film no one saw. I haven’t heard a lot of Oscar buzz for it yet either, but that might have something to do with its release date. Late September is early, very early for something chasing Oscar, right? Much like Argo was early last year (an October release) and didn’t start generating much buzz until right before the nominations were announced. This one doesn’t have George Clooney, Ben Affleck and Warner Brothers campaigning for it, but it does have Ron Howard, Brian Glazer, Hans Zimmer, Universal Pictures and Studio Canal. Those are still pretty big names, of course, so the buzz come later. We’ll see. great review and i like the last two sentences. there was a brief moment in the last race where i thought i was rooting for Hunt. But i too walked away happier for Lauda. i think you enjoyed this a lot more than me. I saw this at home on PPV with ordinary tv speakers. so that might be one reason why. I’m shocked this didn’t get Academy Award nominations for Sound Mixing & Sound Editing. I saw this in XD which is like a lesser version of IMAX and the sound was incredible!